Lease Offer. $4,116 due at signing includes $2,995 down, $0 security deposit, $795 acquisition fee and first month's payment of $326, excludes additional options, taxes, title and fees. Lease Offer. $4,132 due at signing includes $2,995 down, $0 security deposit, $645 acquisition fee and first month's payment of $492, excludes additional options, taxes, title and fees. Optional on the EcoBoost Premium and GT Premium, this 12-inch all-digital LCD cluster lets you personalize your gauge layout with three different views—Normal, Sport and Track. Then, take the custom vibe to the next level with MyColor, which lets you match the gauge hues to your mood. What makes BULLITT stand out? It could be its green accent hand stitching, 12-inch LCD digital instrument cluster, white cue ball shift knob or the wheels with high gloss black-painted pockets. There's a lot that goes into a name. 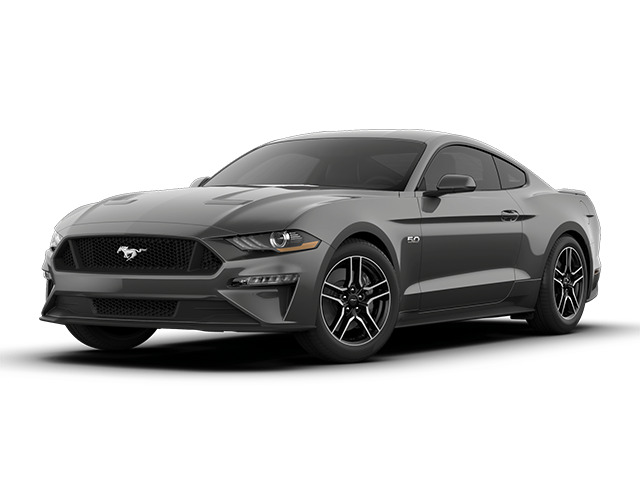 Picture your GT Premium Mustang with this package. Features include 19-inch machined-face aluminum wheels with high-gloss Ebony Black-painted pockets, unique front grilles with offset tribar Pony logo, pedestal rear spoiler, Performance Package front splitter, California Special badging on the interior and exterior, side scoops, side stripes, Miko suede door and seat inserts, and floor mats with red contrast stitching and California Special script logo. The cloth convertible top is electrically driven for quick, quiet operation. You can easily open or close it from the driver's seat, thanks to a center latch. And the trunk is large enough to accommodate your golf bag - even with the optional new B&O PLAYTM Premium Audio with subwoofer. Mustang takes advanced technology and makes it personal. The gauges, for example. Not only can you select the layout, you can also choose the color. With FordPass,TM you can find the lowest price for gas on your route. And with Track Apps, you can instantly view a number of performance metrics on the instrument panel. Think of these features as the brains behind the beauty. You're in absolute control of everything you see. Customize colors. Choose your gauge layout. Tailor each selectable drive mode to get the most out of your driving experience. It's easy to view, fast and responsive. And, like everything else in this Mustang, absolutely beautiful. Optional on the EcoBoost Premium and GT Premium, and standard on BULLITT. Standard on all models, performance metrics are instantly provided in the instrument cluster. Accelerometer displays lateral and longitudinal g-forces, acceleration times and lap times, plus automatic and countdown starts. Also included are features like electronic line-lock* and launch control* (manual only). Electronic line-lock keeps the front brakes locked while Mustang is in gear to warm up the rear tires. Launch control integrates brakes, traction control and powertrain control to help ensure smooth. Sure, Mustang will pin you to your seat when you step on the gas. You expect that from a performance car. Take it for a spin on a course with lots of white-knuckle curves and then, for good measure, subject it to some less-than-perfect road surfaces. That's where you'll discover how its rear suspension and selectable power-assisted steering deliver crisp, responsive performance while the available MagneRide Damping System helps smooth out the roughest of roads. MSRP of $31,105. $4,116 due at signing includes $2,995 down, $0 security deposit, $795 acquisition fee and first month's payment of $326, excludes retailer fees, additional options, taxes, title and registration fees. Total monthly payments equal $11,736. Total payments equal $15,526. Actual rates and payments of closed-end lease may vary. Not everyone will qualify. You must take new retail delivery from dealer stock by 4/30/2019. Lessee responsible for insurance, maintenance, excess wear and excess mileage over 36,000 miles at $0.25 /mile. All amounts shown are estimates, retailer sets actual amounts. Includes all applicable offers. Residency restrictions apply. Lessee has option to purchase vehicle at lease end at price negotiated with retailer and approved lender at signing. Termination fee may apply. Contact dealer for availability and for complete details. MSRP of $42,345. $4,132 due at signing includes $2,995 down, $0 security deposit, $645 acquisition fee and first month's payment of $492, excludes retailer fees, additional options, taxes, title and registration fees. Total monthly payments equal $17,712. Total payments equal $21,352. Actual rates and payments of closed-end lease may vary. Not everyone will qualify. You must take new retail delivery from dealer stock by 4/30/2019. Lessee responsible for insurance, maintenance, excess wear and excess mileage over 36,000 miles at $0.25 /mile. All amounts shown are estimates, retailer sets actual amounts. Includes all applicable offers. Residency restrictions apply. Lessee has option to purchase vehicle at lease end at price negotiated with retailer and approved lender at signing. Termination fee may apply. Contact dealer for availability and for complete details.